Windows Azure Portal is now all new. It is made in Silverlight. Almost all information is on one page and almost all operation can be performed from same page. Properties Windows for Deployment, Role Instances, and Hosting Service provide extensive operation. Configuring OS to SWAP VIP can be performed from top ribbon controls. Left panel contains online How to guide and options to perform other operations. I will cover in detail in later article about new look portal. Purpose of this article to walkthrough how we can host ASP.Net Application in new Azure Portal. 2. 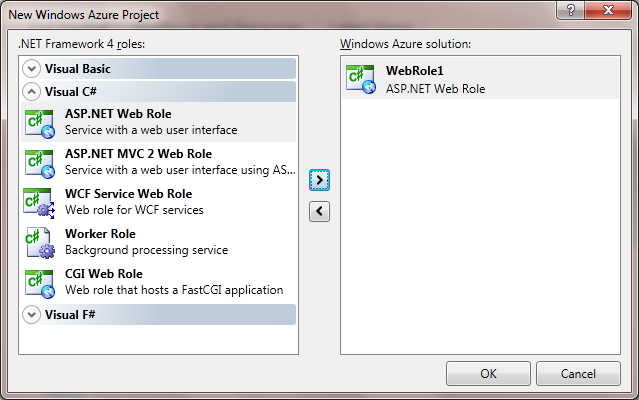 Create new project and select Windows Azure Project Template from Cloud tab. 3. Select ASP.Net Web Role and click on Right arrow key. 4. Just modify something to test in Default.aspx. 5. Right click on Cloud Project and select Publish. From two options given select Create Service package only. On click of Ok you will get published success message and two files created. We need to provide full location of these files to host application in azure. So make a note of this path. Application is up and running on local app fabric. Login to Azure Development portal. After successful login you will get option to move to new Azure portal. Choose that option. There is no need to fear while moving to new portal because any time you can switch back to old portal. In left panel you will get Hosted Service listed. I have one Hosted Service created and that is listed as count next to Hosted service option. To create new service click on Hosted Service , Storage Account and CDN option. I have already a Hosted Service created called FirstApplication. Here we are going to deploy Asp.Net Web Application in this hosted service. 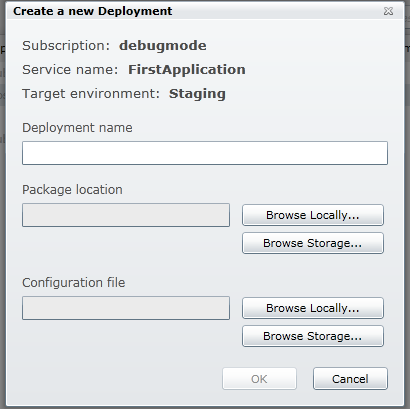 Click on FirstApplication then click on New Staging Deployment at top. Note here is debugmode is name of my subscription. On click of New staging Deployment on top ribbon below window will popup. 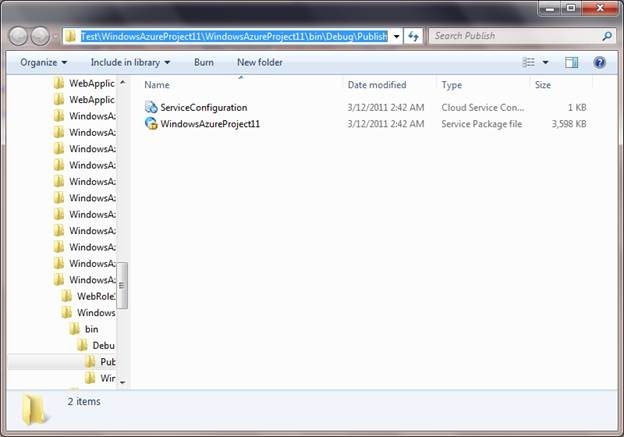 We need to provide Deployment name and need to browse to package file and configuration file. We created and packaged ASP.Net Application on local system. So we will select Browse Locally option. If we have configuration fie and package file in some of storage like BLOB then we will choose Browse Storage option. On Browsing Locally, give path to exact location where you have packaged and configuration file saved. We provided Deployment name as Test1Demo. Once browsing to package and configuration file Click on Ok.
Once I click on Ok button, I got below warning. 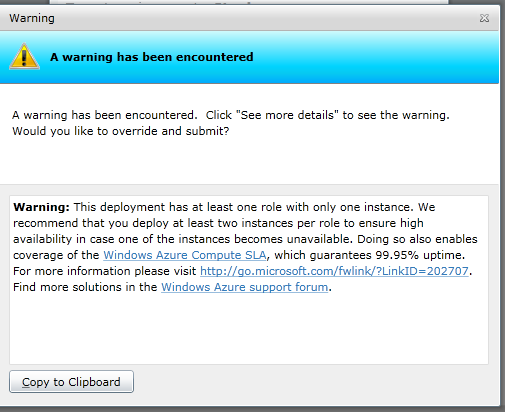 When I clicked See more details, I come to know this warning is about only one instance of Web Role. Ignore warning and click on Yes. If you want you can increase count of Web Role instance. Once clicking ok you can see changing messages about various Deployment stage. After some time you will get message Ready as below. 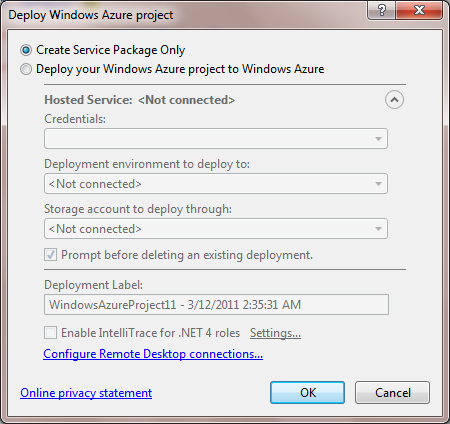 Now your application is hosted in Azure Staging server. 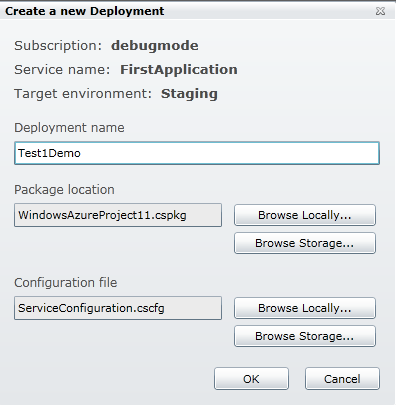 Click on Deployment name [Here it is Test1Demo] . After clicking on that click on DN Server URL in Properties tab to open the Azure hosted ASP.Net Web Application in browser.